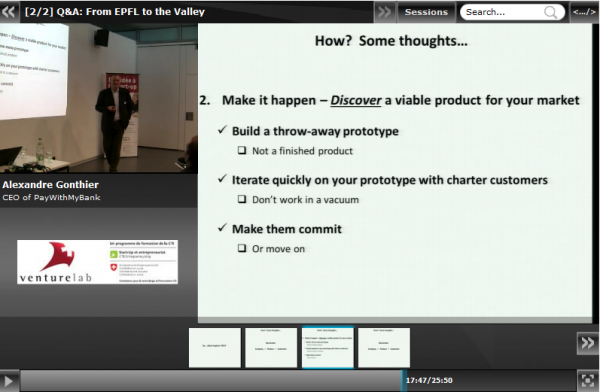 Another exciting Venture ideas event that was webcasted by Klewel. We are very pleased to be working so closely together with Venture Lab on their ambitious project of bringing successful business people to their students to show them that pretty much everything is possible with the right attitude and resources and background that is offered at EPFL The program, Venturelab was launched in 2004 as a national training program for innovative high-tech startups. Since it was originally mandated by the Commission for Technology and Innovation (CTI) to coordinate the initiative, the IFJ Institute for Young Entrepreneurs has conducted over 3,000 venturelab course modules all over the country which included more than 25,000 participants. As these priceless speeches are captured and published with Triskel, it is great to know that it can be visible for students and any other people to see even if they were unable to attend. On September 20th, the invited guest was Alexandre Gonthier, who is a Swiss Entrepreneur and EPFL alumnus (MS in Communications Systems) based in Silicon Valley. His area of focus is the online and mobile payment industry. He is currently the CEO of PayWithMyBank and eWise. Before that, he co-founded and was the CEO of iPIN, an online and mobile payment company, which was acquired by Intel Corp. He was also the CTO of Paymo, which combined with BOKU to form the world’s fastest-growing mobile payment company. And he was the CEO of Trinity Mobile, which combined with Ticketscript to form Europe’s fastest-growing online and mobile entertaining ticketing company. Alex is also very active in the startup ecosystem. He is a Venture Partner at venture capital firm Wellington Partners and was an Advisor to private equity firm 3i in London. His interesting conversation went from explaining his story to giving hands on advice to young entrepeneurs and some Q & A at the end. 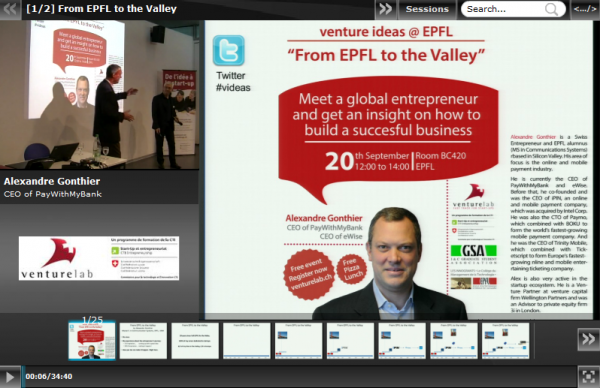 Triskel capture station and webcasting platform was used to webcast this edition of Venture Ideas at EPFL. Triskel capture station and webcasting platform is the product of Klewel advanced webcasting solutions.